This trend is probably something we've all seen before. Get rid of the blended patterns and put together bold, simple, and saturated colors to create an even more interesting look. It has always been huge during the spring, and although it's fairly popular, there are unique and newer ways to handle this trend. Instead of pairing two extremely bold colors that really don't match, try pairing one bold color with a neutral that compliments the color. This effect is best done in a single clothing item, so instead of thinking about this trend while putting together outfits, try it while shopping. I knew I wanted a dress that used the color-block trend, so a few weeks ago, I went online to Madewell to find one. I found a perfect collared dress with a definite split between the two colors -- white and a bold blue (the dress I'm wearing in the photos above). The shapeless fit of the dress and the contrast between the blue and white gave off a mod look that is perfect for spring but that also used the color-block trend perfectly. Because the two colors are in a single dress, the trend is more obvious and creates a far more interesting outfit than pairing a white blouse with a blue skirt. To complete the look, I opted for my strappy black sandals for yet another simple color. And to finally contrast with the white, black, and blue, I wore berry lipstick, which even furthered the color-block trend. Overused patterns can get to be extremely dull, so one of the best options is to mix simple colors for a new and modern look. I’m just now talking about my outfit from Friday because I was in Athens all weekend due to a dance competition (which, by the way, went really well!). Anyways, I wanted to do something comfortable because I had to drive down to Athens after school and perform my solo only an hour after that. Because it’s basically impossible for me to dress just for comfort, I decided to add a cute factor to a comfortable outfit by using “vintage” items. They may not technically be vintage, but the top is from my dad’s ultimate frisbee team from UGA and the chambray shirt (which I’ve been wearing way too much recently) is my mom’s from her early adulthood (and the hidden paint stains definitely add a vintage touch). As you can tell, the top does have a few holes in the top, but it added a grunge factor without being obnoxious. The most annoying thing is how clothing brands (like Free People) sell t-shirts with holes in them for over $40 when you could just steal one of your dad’s old tees that already has holes in it from the years of wear and tear. In this case, I think the holes are okay because the shirt is actually old. And in this top, the geometric shapes (that I soon found out were the shape of Georgia) give off a mod look that contrasts with the vintage feel of the top. I paired this distressed top with my favorite green circle skirt from Urban Outfitters and layered the old chambray top over it to complete the look. Finally, to once again contrast with the older style, I paired my new metallic sandals from Asos with my black thigh highs. In the end, I almost looked like a pretentious art student, but honestly, I was okay with that. Practically everyone has been talking about it this season -- ditch the bright spring colors and opt for more basic and neutral schemes. I’m a huge fan of this idea because I know for a fact that many bold colors don’t necessarily flatter everyone, including me. For example, the only bright colors that really look good on me (in my opinion) are blue and pink, so the overrated spring color trend doesn’t exactly work for me. Also, this new color scheme is completely unexpected. Winter is for neutrals, and spring/summer is for bright colors. I have now discovered that neutrals are year-round, it’s just the little things that differentiate these colors from season to season. As you may already know, I did dark and cool neutrals this January (which you can find here), and that is the exact way to style neutrals for the winter. Spring is the complete opposite -- light and warm neutrals. The only thing breaking that rule in this outfit is my chambray top (it’s cool), but it’s such a light shade that it fits in perfectly with the rest of the outfit. 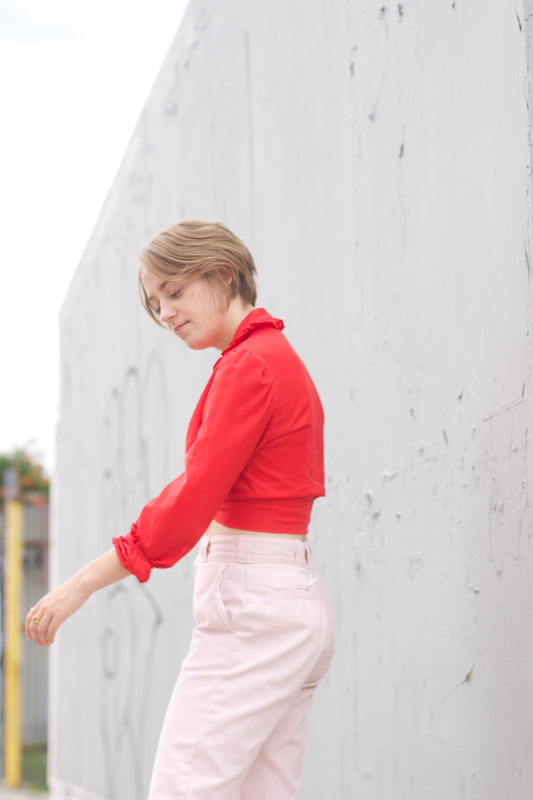 I achieved this look by taking my white skirt from Loft (that I can finally wear without being judged due to Spring) and pairing it with a pale pink top from Urban Outfitters that is so light it almost looks white like the skirt. The similar colors create a pseudo monochrome look, which is also definitely in this season. To add a touch of color, I layered my favorite chambray shirt over the outfit. Honestly, I would have worn chunky white sandals with this outfit to continue the color scheme, but unfortunately, all of the shoes I own are dark. However, the single touch of black adds emphasis and contrast to the outfit that ended up working perfectly. Outfits can also have the principles of design, just like art. And even my almost platinum hair matched with the light neutrals in this outfit! For hair and makeup today, I created beach waves with my flat iron (my favorite thing to do, probably). I then wore an extremely natural face (only mascara, no eyeshadow!) and wore my bright pink lipstick to also add emphasis to the neutral outfit. The simplicity of this color scheme is going to be all over stores pretty soon, so I would suggest in investing in lighter neutrals to add to your closet. The best part about them is that they match with everything if you do decide to find a bold color to wear this Spring. First off, I apologize for posting at such a late hour! I won’t be able to post again until Monday because I have dance competition on Friday, prom on Saturday, and more competition on Sunday, so I did not want to keep you guys waiting. Also, I really liked this outfit today, so I wanted to share it. Also, I also apologize for taking these pictures inside. I’ve been extremely busy, and taking the photos in my room takes 10 minutes less time. The lighting outside is so much better, but this area will have to do for some time. Today was all about learning how to dress down something that could be worn to a nicer event, like a night out with a fancy dinner or even a banquet of some type. I was wearing the outfit to school, and I’m all for dressing up more than the norm, but I still did not want to go over-the-top. The lace trip on the top and sleeveless nature of this shift dress was just a touch too much for a casual school day, so I added a layer (as I always do) to dress down the look. The layer actually happened to be an REI shirt that even has a little bit of paint on the side (I probably shouldn’t be telling you this, but...) that I think I’ve used for art projects. The shirt definitely did dress down the formality of the dress, but the casual feel of the top didn’t destroy the outfit. It gave it an artistic character and more complexity to a simple (yet nice) dress. Also, the light blue of the shirt and the deep green of the dress really worked well together, which was truly not my intention. The way to dress down anything is to add something, not take away something (and I’ve obviously not talking about nice jewelry). Any type of layer (a shirt like this, a leather jacket, a drapey cardigan, etc) can work, but also adding tights and boots to a formal dress or layering a pullover sweater over a dress can work, depending on the fit of the dress. Yes, it is always nice to dress up, but some occasions do not call for this type of formality, and at times, you really have to be in the mood to do it. And you might say that the lipstick makes outfit more formal, but in my opinion, lipstick is always okay and adds flair to a fresh face. Lipstick is also something people know me for, so it’s pretty hard to go a day without it. The best part about this outfit is that I could wear it with the shirt for a casual yet fashionable look at school, and when I went out to a nice restaurant for my mom’s birthday tonight, I could simply take off the layer to dress up the outfit. This is such an obvious spring trend, but it felt necessary to write about after wearing this fun dress from Topshop. Florals will always be in style, even in the winter, so discussions about this trend are always changing. Honestly, I'm not the biggest floral fan myself (sometimes it's too feminine for my style), and this is a dress I usually wouldn't wear, so I'm going to explain how to make the floral pattern less over-the-top with a few tips. Florals are going to be everywhere this spring, so is there a way to make the pattern unique? That's the question I asked myself before creating this outfit, and I decided to take things I usually do with my outfits and add it to this dress to lessen the femininity and make it more like my style. As you probably know already, I'm obsessed with tying shirts/jackets around my waist. It's convenient but also makes a dull outfit more interesting (and who doesn't love this classic '90s trend?). I've talked about it thousands of times on this blog, but today, I felt like it was really needed with the dress. The dress is already so bright, so to lessen the colors, I tied a simple black and grey pinstriped shirt around my waist to contrast with the poppy colors and to add one of my signature looks to a dress that isn't really my style. (Side note: the dress is actually my sister's, so no, I did not waste money on a dress that I wouldn't usually wear. But hey, I figured out how to make it my style today!). To add edge to the outfit, I wore my black cut-out booties (as always) to complete the outfit. Also, I made the look more my style by wearing wine lips (specifically Bite lipstick in mulberry), because what is a true Natalie look without a bold lip? This season, I hope to see more people trying out florals in different ways. It's such an overused trend that will never fade, so it would be nice to see it in unique styles. All I did today was add basics that I always wear to lessen the extreme of the floral pattern, but there are probably thousands of other ways to make floral more interesting. Maybe to add a layer jacket over a floral top, or to add a chunky sweater to a floral skirt. The possibilities are endless, and I'll be sure to dig out my floral items and create more unique looks with them. And Coachella 2015 is finally here... The weekend where more people care about the fashion than the music. Honestly, I was almost able to go because my spring break was this week and we were going to visit California, but tickets sold out in under two hours, so instead we went to St. John in the Caribbean. While I would have gone for the music (a few of my favorite bands, like St. Vincent, Marina and the Diamonds, and Jack White are there), many would go just for the unforgettable experience and the unique fashion it brings. Only a few of the outfits at Coachella truly impress me, so instead of praising its fashion, I'm going to point out the problematic aspects of it. While many outfits just are not cute in any way, some are extremely problematic and even offensive. And here's where I bring up the controversial term people either love to debate or roll their eyes at: cultural appropriation. For the few people that are not familiar with the term, it is the "adoption" of an aspect of one's culture, usually an oppressed culture, that is done without the "consent" or original use/meaning of the culture. In simpler terms, it's basically stealing parts of a culture and using it in a way that was not intended of the original culture. This term is an extremely grey term because many people who culturally appropriate claim that they were respecting the culture, but the only true way of knowing is if that person is from the original culture or was using the culture by its intended meaning (example: a white person wearing a bindi at a Hindi event). These cases are okay, but in many other circumstances, especially festivals like Coachella, the people wearing other people's cultures are definitely not doing it in a respectful manner. Examples include bindis (the most popular), Native American headdresses, and even Hindi nose piercings. These "fashion trends" are done by hundreds of common people at Coachella, but I decided to use a few famous examples who appropriate cultures just for the sake of fashion. All of these examples are from Coachella 2014 because not many photos have been released for this year, but these problems definitely still exist in Coachella 2015. She's probably one of the most problematic celebrities out there when it comes to cultural appropriation. I swear, every year she has been going to Coachella, she has worn a bindi. And not in a respectful manner -- she treats it as a fashion statement/accessory without even acknowledging its real use. So many people praise this celebrity for having the best fashion and "festival aesthetic", but really, she is just downright offensive. For the uninformed, bindis are forehead decorations (can be jewels or simply a dot) that are worn in South Asia that is a symbol of the Hindu religion. To an extent, it has evolved into a fashionable accessory that can be worn with a sari, but it's religious meaning still stands when used this way. Vanessa Hudgens, however, was not using it correctly. She probably sees it as a boho trend that makes her look more "Coachella ready" and may not even know the meaning behind the bindi. She may even call it "face jewels" (like Urban Outfitters once did) because she is so uninformed on the accessory she is wearing. I'm not Hindu, so I'm in no place to call what is offensive and what isn't, but I know of many Hindus that do believe this statement is offensive, which defines it as cultural appropriation. Because Vanessa probably has no idea what she is truly wearing on her forehead (or maybe she does, yet she fails to respect the culture), it is considered cultural appropriation. And, because the group was technically oppressed (and even some would be disgusted by an actual Hindu wearing a bindi but would praise the white girl wearing the new fashion trend), Vanessa is in no place to wear the bindi. Yet, she still does. Yes, another bindi. Selena Gomez may be a fashion icon to many (and maybe some of my readers), but once again, she is just as offensive as Vanessa. The only reason I'm including her along with Vanessa is because this is not the first time she has culturally appropriated. At the 2013 MTV Movie Awards, she wore a bindi during her performance of "Come & Get It", which already has cultural appropriation in the song itself (it starts with a man singing in Punjabi). While in this case, she did know the meaning behind the bindi, she stole Hindu traditions and used it for her own music and performance without respecting the culture. And of course, she didn't learn from this incident, because she still continues to wear the bindi at festivals. And here we have Kendall Jenner, the queen of being problematic (right under her sister, Kylie, who has done far worse things such as "unintentional" blackface). This is one we haven't seen before, and many people probably have no idea what it even is except for a huge, tacky nose ring. However, it does come from the Hindi culture -- it is a nose ring worn by the bride at traditional Hindi weddings. While people could argue that all nose rings are cultural appropriation (which I don't agree with), this is so obviously stealing from the Hindi culture that it's just completely ridiculous. Even if it wasn't cultural appropriation, it still looks tacky and does not work with her simple outfit, but the fact that it is so obviously cultural appropriation makes her look extremely offensive. Of course, this is not the last time she has culturally appropriated. She wore a bindi on the other days of Coachella last year, and she even wore a hijab (along with Gigi Hadid) as a fashion statement. If more Coachella pictures from this year are released and I happen to see trends I am actually fond of, I may make a post showing Coachella trends that are actually not problematic.